Mustafa Guler is no stranger to restaurant, and hospitality business as he spent most of his life in Turkey doing just that. After arriving to Chicago in the late 90s, he introduced Turkish cuisine to Roscoe Village at Turquoise Restaurant. After serving many Chicagoans the delicious recipes he put together for many years, he decided to seek something different. Upon selling Turquoise in the early 2018, he spent some time in Turkey collaborating with local chefs on traditional recipes. Summer of 2018 brought his delicious findings, and the chefs he met in Turkey, opening Cafe Istanbul. Stop by at one of the two Cafe Istanbul locations to experience the difference in his traditional twist of Turkish Cuisine prepared by chefs he met himself in Turkey. 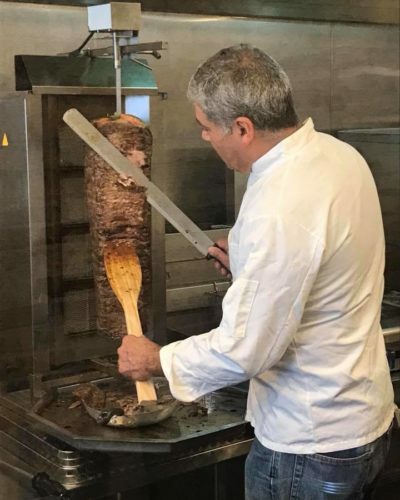 Our specialties include wood-roasted lamb doners, chicken gyros, kebabs, pita and thin-crust Turkish pizza with ground beef and seasoned vegetables, all cooked with charcoal or wood.There will also be Turkish pastries and other baked goods.